Microsoft Windows Upgrade – Windows Migration | Innovative Network Solutions, Inc. Performing a Windows upgrade can be a tedious and time consuming task especially when it’s on a large amount of PC’s. INS is a Microsoft Solution Partner and can assist with your Windows upgrades. Keeping your Windows software up to date is crucial to the security of your systems. We offer full service project management of your Windows upgrades. Whether you want to just update Windows, or need assistance purchasing new PC’s/Laptops with the latest version of Windows, INS can get you from purchase to installation for a flat rate. Microsoft products tend to have a 10-year life span. It’s easy to overlook the end of life to a version of Windows because typically, it will still function as usual. The importance to the Windows 7 end of life as of January 2020 is that Microsoft will no longer provide security patches and bug repairs for Windows 7. Yes, those pesky pop ups from Windows that tells you to restart because there is a system update available aren’t just to bother you. The updates provided actually help protect the integrity of your system. 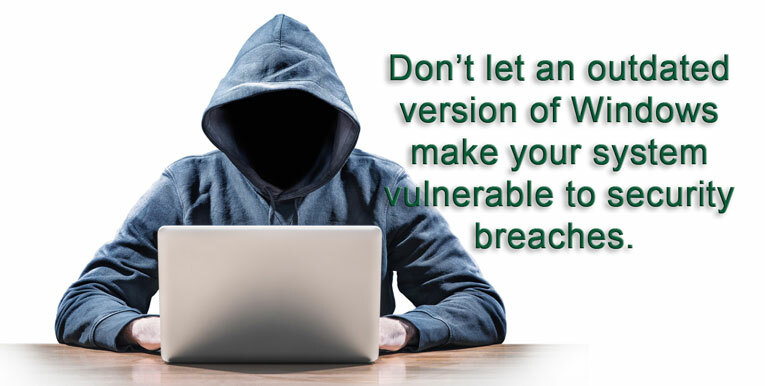 Many industries such as Credit Unions or Legal face compliance issues remaining on Windows 7 after its end of life because of the potential security concerns. A Windows 10 migration helps remediate the complications that come from the Windows 7 end of life, and INS can partner with you to handle your Windows 10 migration projects. As a Microsoft Solution Partner INS provides full scale project management for Windows 10 migrations. We will assign a local senior level team who will make recommendations on the best and most cost effective route for the Windows 10 migration. In some instances, it is more cost effective to replace out of warranty PC’s/Laptops completely vs just migrating to Windows 10. Our team will examine your needs, make recommendations, and partner with you to ensure success. If you have an existing IT Team that does not have the time for a Windows 10 migration, INS can assist by completing the project while your team focuses on support. Our Windows 10 migration support fee is a flat rate that varies based on scope of work. INS is happy to provide a free no obligation consultation to discuss your Windows 10 migration needs. Complete service for Windows 10 migrations! We handle the upgrade so your team can focus on Support! Get ahead of the Windows 7 end of life! Contact us today for your Windows 10 migration needs!